Born in 1959 to a musical family, Raphaël Oleg entered the Conservatoire Superieur de Musique de Paris at the age of twelve to study with Gérard Jarry. He graduated in 1976 and continued his studies benefiting with Henryk Szeryng, Christian Ferras, Emmanuel Krivine and Jean-Jacques Kantorow. Raphael also attended master classes by Pierre Bernac in 1977 and Elisabeth Schwartzkopf in 1980. Gold Medal winner at the Tchaikovsky Competition 1986 in Moscow, an award rarely given to non-Russians, Raphael made his spectacular debut the same year at the Lucerne Festival, replacing at short notice Josef Suk with Vaclav Neumann and the Czech Philharmonic Orchestra. Following these successes came invitations to perform with Lorin Maazel (Philadelphia Orchestra), Jeffrey Tate (London Symphony Orchestra), Riccardo Chailly (Royal Concertgebouw Orchestra), Wolfgang Sawallisch (Munich Staatsoper), Armin Jordan (Orchestre de la Suisse Romande, Ensemble Orchestral de Paris), Semyon Byshkov, Günther Herbig (Orchestre de Paris), Libor Pesek (Royal Liverpool Philharmonic Orchestra), Yan-Pascal Tortelier (BBC Philharmonic), Tadaaki Otaka (BBC National Orchestra of Wales, Yomiuri Orchestra, NHK), Mark Wigglesworth (Dutch Youth Orchestra, Utrecht Philharmonic Orchestra, BBC NoW), Ronald Zollman (Orquesta Filarmónica de la UNAM à Mexico City). Raphael has toured throughout the world with many of the world’s leading orchestras and conductors including the Orchestre National de France with Lorin Maazel, the Academy of St-Martin in the Fields with Sir Neville Mariner, the Swedish Radio Orchestra with Evgeny Svetlanov, the Tokyo Philharmonic with Kazushi Ono, the Chamber Orchestra of Europe with Paavo Berglund, the Orchestre du Capitole de Toulouse with Michel Plasson, in Japan with Marek Janowsky and the Orchestre Philharmonique de Radio- France, Australia and New-Zealand with Libor Pesek and at the Salzburg Festival with the Warsaw Philharmonic and Kazimierz Kord. A keen chamber music player, Raphael Oleg has as regular partners Antonio Meneses, Barry Douglas, François Guye, Clemens Hagen, Christian Ivaldi, Jean-Bernard Pommier, Emmanuel Strosser, Jean-Claude Pennetier, Anton Kuerti, Gérard Wyss, Sonia Wieder-Atherton, François-Frédéric Guy, Jeremy Menuhin, Gary Hoffman, the Johannes quartet, the Sine Nomine Quartet and the Manfred Quartet. A great supporter of contemporary music, Raphael has premiered violin concertos by Michel Decoust, Renaud Gagneux, Serge Nigg (2nd Concerto), Philippe Racine ( ‘Promenade’ at the Lucerne Festival) and Ivo Malec whose ‘Ottava Alta’ he recorded for Timpani records (Diapason d’Or and Choc du Monde de la Musique). 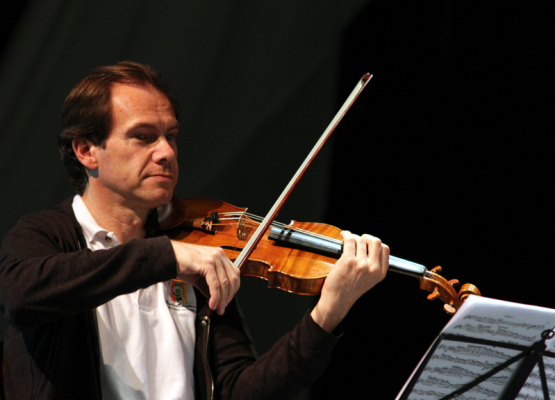 In February 2006 Raphael gave the first performance of the viola concerto by Jinrich Feld in Prague. In 1997, the Académie des Beaux Arts awarded Raphael Oleg the Del Duca Price. Raphael is also Chevalier des Arts et Lettres.